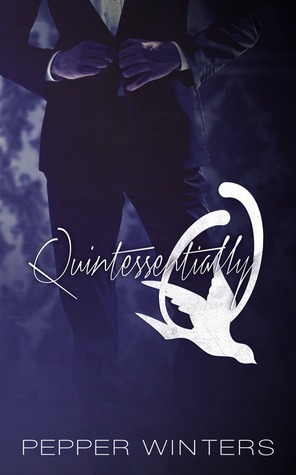 If you loved Tears of Tess, then shitting hell, you are going to fall head over hells for Quintessentially Q. I was hooked to Tears of Tess but I LOVE this book a hell of a lot. I actually had to think long and hard about this review, because its so hard to put into words just how amazing this book is. And Jesus, its still hard to formulate the words to express it. But I’ll give it a go. I have to say, despite the disturbing and violent nature of this book, it’s my favourite out of the series so far. I felt so many emotions throughout this book and I actually cried for about 50+ pages. I cried for Tess, I cried for Q but I also cried because of the heartbreak and the scenarios both of them were going through – alone. I cried for how Tess was being treated, how afraid and angry and monstrous Q was. Dear god, the tears just kept coming, the emotions, from sickness, to my stomach muscle tightening, to the heartache and the light relief of this couple finally being reunited again…. But then my emotions didn’t stop there. It was a constant roller-coaster with this book and when Tess was broken, was empty, I cried for her feeling nothing. Her kidnappers broke her so much that she was seemingly unfixable and as much as she tried to get ‘unbroken’, she just couldnt see past anything. I prayed that she could get past it,that she could push past it and i felt broken reading about her being broken, about her being at that point where she didnt care, she didnt feel, she was just so numb and it killed me to watch this strong women like this. But all bad things turn good eventually…. I cried for Q who you know has deep feelings for Tess, who would maim and kill and do anything to get her back to the strong Tess he knows. I cried for him trying to get her back to her old self, how much time and effort and love he put into trying to get her to talk but it was useless. I saw his fear, how exhausted he was, how he tried and tried to get Tess back…i saw him be defeated and that killed me. No joke, you feel every single emotion these two go through and I cannot tell you how this book broke me and then fixed me back together again. I cant tell you how much I wanted to see a different side to Q and Pepper sure as hell let us! We see the softer side of him come out, the side where we know he loves Tess, how she is actually the one for him, his monster, like he is hers. Although he doesnt know what he is doing and his feelings are confusing the hell out of him, he wants to make sure Tess is happy with with and yes, he is still the dominant alpha we all loved, I loved this whole different side to him. I loved how it was dual POV. I loved getting inside Q’s head, how conflicted he was over his feelings, over how he should act – did he love her? How was he going to get her back? We saw plenty of sides to him and each broke me a little. From the slight touching moments he gave Tess, to his monster side, his dominant side and his tired side. His POV also gave me hope that maybe Q could love, that he had found his one, albeit in a trafficking way, but it was a bit like fate and then to lose her was terrifying and you knew that he had to track her down, do whatever he could to get her back. He would die without her. I cant explain how much I loved Q. How I draw in his emotions, how he was feeling, every little piece of his emotions pierced my heart, both in a happy and devastating way. I cant tell you how happy I was at the end. Throughout all the pain he endures, to see him have Tess back in his arms, back to her strong self, especially the things he tells her (SWOON), I, for one, cannot wait to see this relationship expand and grow in book three. Pepper, you have turned me over the the dark side and i am loving it!! !